In early 2007, I decided to get a digital SLR. This is a summary of the research and reasoning that led me to purchase the Nikon D80 and the Nikon 18-135mm lens and various accessories as well as my feedback and review of the products. I was looking for a medium level SLR. I narrowed my selection to the two top SLR Manufacturers, Canon and Nikon. Out of the offerings from those manufactures, I considered the following SLR's. The jump from 6 mega pixels to 10 mega pixels was $135. The jump from 8 mega pixels to 10 mega pixels was $145. The difference was justified to me at this point so I knew I wanted a minimum 10 mega pixel camera. For my considerations this eliminated the D40 and the Rebel XT. After handling the Canon Digital Rebel XTi, it just didn't feel right to me. I already owned the Canon Rebel Ti, and I got it because it was lighter than the Nikon N55, but it's always felt awkward in my hands but my wife loved it because of it's lighter weight and smaller size. The popular reviews made it a tough choice to eliminate, but I removed the Canon XTi from my list of choices because it just didn't feel right in my hands. This left the selection of currently available equipment to the Nikon D40x, D80, D200 and the non EOS 30D. I had both some Canon 35mm film equipment and access to quite a bit older Nikon 35mm film equipment (circa 1972). I decided to eliminate the Canon 30D and narrow the selection to the three Nikons. 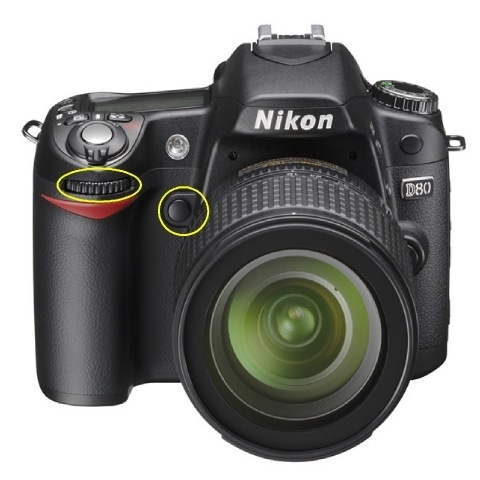 Most of the features are very similar between the Nikon D40x, D80, and D200. The price difference of $600 to $1500 is a pretty big spread. What made the features so much better on the D80 and D200 to justify the cost? I had to gleam most of this information from the Nikon specifications, but the article Nikon D80 vs D200 was also helpful. I included an importance factor to evaluate these. There are some features that I have weighted more heavily after use than when I initially evaluated them. These turned out to be more important than I thought. Width 5 5.0" 5.2" 5.8"
Height 5 3.7" 4.1" 4.4"
Depth 5 3" 3.0" 2.9"
The D40 has a minimum ISO of 200 and shoots 2.5 frames / sec. All other specifications on the D40 are similar to the D40x. The viewfinder was noticeably different between the D40x and D80 and I'm much more in favor of the D80/D200 size and view. The lack of two dials to control both the aperture and the shutter speed were very important for me. With the Canon Rebel Ti, which has one dial, this made manual mode very annoying. I was used to using a Nikon F with full manual mode and this turned out to be the single most important factor for me in evaluating the three camera bodies. I found that having to use the menus to set the Aperture / Shutter speed / ISO was very distracting for me. I much preferred the ability to controls these directly on the D80 and D200. The weight doesn't look that different on paper but in actual use my perception was very different. For my personal preference, the D40x is light, the D80 moderate, but the D200 is moderately heavy. There have been some discussions on this fact so don't disregard it lightly. The feedback is it's either sturdy or heavy depending on your point of view. The only way to tell is to hold it with a lens attached. Having the ability to set the ISO and White Balance with a button and dial instead of using the menus as on the D40/D40x is a convenience. I found I did not like ISO Auto and instead preferred more manual control. Therefore the ability to set the ISO became something that was more important to me over time. The D40/D40x does not show having a wired remote ability. If you want to take exposures longer than the 30 seconds on Bulb, you'll be limited to holding the button on the camera down and if you're like me, you'll shake the camera. For the frame rate, 2.5 or 3 frames per second sounds like a lot on paper. After shooting a few soccer games, my feeling is it's slow. Not so slow as to be aggravating, but it's come up about once per game that I'd like faster frames / second. Not enough that I'd be willing to pay the price increase for a D200 or D300. The D80 does have the ability to show the ISO in the view finder, but the FUNC button has to be configured to show this. Again, this isn't something I thought was important, but in using Auto ISO, or changing the ISO manually it does become more important. Supporting a Pre-AI lens was important to me since I had access to my Father's circa 1974 set of Nikon lenses. It turns out these are pre-AI lenses and although they were Nikon F mount, the aperture ring conflicts with a minimum aperture sensor on both the D80 and D200 bodies. The Pre-AI lenses could be modified to fit the AI required mount for the D80 and D200. Reading all the reviews on the D40x, D80, and D200 led me to believe there was not any significant difference in image performance between these bodies. I could spend $250 more than the D40x and get the D80 which gave me the important two command dials and external buttons, and the wired remote feature. 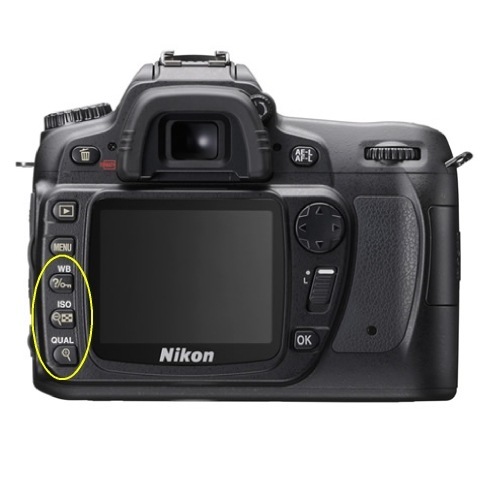 Below is a picture of the front and back dials on the D80 that show the features (1 dial, 4 buttons) that are present on the D80 that are not on the D40x. The front of the D80 has one button and one dial that are not present on the D40x. The D80 button can be configured to be used for several different features. I have mine configured to display the ISO setting in the viewfinder. The back of the D80 has three buttons that are not present on the D40x. These are for White balance, ISO, and Quality settings. When presed in combination with the command dial in the upper right, these allow direct setting of these values without having to use the full screen LCD menu. I could spend $850 more than the D40x or $600 than the D80 and get the D200 which gave me better metering, a faster frame rate, and the ability to meter on AI manual lenses. In the end, I purchased the Nikon D80 as the most appropriate feature for cost value for my situation and I've never regretted it. This is equipment I've actually bought and used. It's not just a wish list. I am happy with all of this equipment. I had a 28-90mm zoom and a 43-86mm Nikkor zoom. I knew I wanted a zoom lens and not a fixed focus length lens. What I really wanted was the 18-200mm Nikon zoom. For most of 2007 this lens has been on back order and I couldn't see waiting three months to get a lens that has problems with the zoom barrel slipping. I had this problem on the 43-86mm and while for some it may be just a nuisance, I can't see spending that kind of money with something that has that kind of a problem. I went with the Nikon 18-135mm zoom lens. The Nikon 18-135 is a great lens for me. There are reports that this lens has some quality problems and I have found on two occasions when shooting with the camera rotated 90 degrees, that the motor made an unusual grating sound. I repositioned the camera back to horizontal and the problem went away. Others have reported this problem as well. I don't know if this is going to be a problem in the future or not. Other than this one problem, I love this lens. In discussion, a lot of professional photographers mock this lens since it's not "professional" quality. The lens takes better pictures than I have skill for at this point in time so I really have no complaints. I've read the MTF and spec charts on the lens compared to "professional" lenses and I've come to the conclusion that it's just as good a lens, but has only one drawback when compared to those lenses, it has a plastic mount. It has a manual focus ring which can be overridden without flipping a switch. I do find myself with a lot of shots taken at 135mm so that's got me wanting a little more focal length. 135mm is fine for about 50 yards or less on the soccer field, but beyond that shots require cropping. The MC-DC1 is a must buy. I've used it several times for lunar eclipses and some slower landscape shots with the shutter delay on. I I should have bought this when I bought the camera. The BM-7 LCD cover is my second one. I have no idea where I lost the original, but I'm glad their not expensive. The Lowepro Topload Zoom Mini case holds the Nikon and the 18-135 but just barely so. I had this case previously with a Canon so I just continued to use it with the Nikon. If I get another, it's going to be something with a little more room at the end of the zoom. The selection of these two lenses is based off feedback from discussions and users in other groups. Everyone seems very happy with the 70-300mm VR and the only complaint is that it's not 2.8. For $400 compared to the 80-200mm f2.8 or $1200 compared to the 70-200mm f2.8 VR, I'll stick with this one. In addition, it's a perfect match to the 62mm filter size to correspond with the 18-135mm lens. The 50mm f1.8 has gotten rave reviews and I want to try the fixed lens and it's not a big cost. I had the 50mm f1.4 Nikkor-S and the faster lens does make a significant difference in some circumstances. SLR Gear MF Ring hard to use, outside. After reading about all the plethora of lenses available both older F mounts with AF and the newer lenses, this is the list that I've put together. When folks are asked what equipment they have and they recommend, these lenses keep popping up in the lists. I looked at these, and most of them are a bit more expensive than I'm willing to invest in what is mostly a hobby or would duplicate what I already own. If I made income doing photography, the price of these would be easier to justify. The one exception in cost is the Nikon 55-200 mm. This is a very compelling lens in quality and range. It fills the gap beyond the 135mm lens I have without having to spend a lot of money. All the tech specs look good for the cost. When I tried it out, it just didn't seem to feel right for me. I don't have a good way to explain it, I much preferred the 70-300mm VR with the manual focus ring and the feel for the lens and that's why it's on the list to buy instead of this one. There is not really enough difference in 200mm versus 300mm to really worry about, but the 70-300mm VR is just more appealing to me. I've listed these here for my benefit. People seem fond of the lenses in this list and I like to refer back to them from time to time. Who know,s maybe I'll hit the lottery and the $1600 for the 70-200 VR will seem worth it to me at some point. Nov 12, 2007 - Added intervalometer and shutter delay options. May 30, 2008 - Updated prices on equipment. As of May 2008, it's been over a year since I bought the Nikon. I've purchased the 50mm f1.4 and I really love the camera and the lens. There are some circumstances where the 18-135mm lens just doesn't grab enough light (indoor band concerts and indoor basketball courts) but the 50mm f1.4 really helps. The 135mm lens does not have quite enough reach beyond 50 yards on a football or soccer field. 200mm or 300mm is much better. I've tried the non VR 70-300mm lens and I'd definitely recommend the VR. It's kind of difficult for me to get a sharp focus at 300mm even in a bright sunny day on a soccer field without VR. The 18mm lens also gives a good wide angle when needed. I still find a lot of my shots are beyond 100mm. There are several folks who have had problems with the 18-135mm lens from what appear to be a loose connection. I've experienced problems on three occasions with a strange noise trying to focus when the camera is turned on it's side. Straightening the camera out made the noise quit. I've also found I can use some of the old equipment with a few tricks. A 50mm macro lens can be fit to the D80 with adapter rings, and a Vivitar 283 can be made to fire from the onboard flash.